The first time I saw Batman: Dead End was on a bootleg DVD my brother picked up at a sci-fi convention, which were places we would go to usually to shop for cool movies no one had ever seen yet on a video shelf. Back in the 1990s and early 2000s, a company called Creation would have Star Trek Coventions somewhere within New York's Madison Square Garden. Though Star Trek was the main focus of these conventions, which were basically a theater where the guests would speak to the attendees or film trailers were screened and then there was a huge flea market like sales floor where all sorts of costume pieces from a variety franchises and tons of books, comics and videos were sold. Now everything everywhere in every state or country is basically a Comic Con and while I am sure Star Trek conventions still exist, the success of conventions like San Diego Comic Con and New York Comic Con have eclipsed th smaller venues to a point where one has to wonder whether or not having a theme specific convention is still profitable in an environment where the bigger cons yield more exposure and are simulcast on social media for free. One of the biggest if not truly the mother of all professionally made fan films was and still is Batman: Dead End, but aside from being the first notable short film to present franchises that were and would appear in multi brand event graphic novel spin offs, Batman: Dead End would kind of fade away from the point of view of a Sci-Fi aficionado in Brooklyn, who was unfamiliar with the talent that made the film and the story of how the film would move from a concept to what happened afterwards. Now on DVD and through multiple Video On Demand services, people can learn about the director Sandy Collora, who moved to California from New York with creative dreams and great artistic talent to sculpt and paint things for his employers. After a brief stint working at Stan Winston Studios, Sandy would eventually find himself earning approximately ten thousand dollars a sculpt for the burgeoning collectible market while being mentored by a great artisan in the industry he admired and who saw talent within Sandy. Finally with $35.000 from his own pocket, Collora went about to make a calling card. By this time he had moved on from making sculpts for statues and toys to directing TV commercials, but was frustrated that no one in Hollywood he wanted to impress was responding to his reel. Eventually, armed with years worth of developed materials he got his film made that early on had Sylvester Stallone and Mark Hammil attached to play Batman and the Joker respectively. While this would ultimately not come to pass, he found his Batman in Clark Bartram and the Joker was played with glee by the late Andrew Koenig, who may be remembered by some as Kirk Cameron's best friend in the 1980s family sitcom Growing Pains and whose father play Chekhov on Star Trek and in it's many incarnations. Notably the now iconic Big Red Predator seen in the film's final moments is what continues to live on through NECA Reel Toys' popular seven inch and quarter scale Predator figure line. The crux of this film is basically how a man with a vision turned it into a reality and subsequently the tidlewave of acclaim that followed, which was overshadowed by his own ego and unwillingness to compromise with the Hollywood studio system and how he eventually would direct the low budget, high production value sci-fi film Hunter Prey, which I think I have seen on Syfy and the new project he is working on entitled Shalow Water. This is an interesting documentary that one wishes the fan film that inspired it could have been included, but for obvious legal reasons it is not although you can stream it for free on YouTube. The DVD presents Behind The Mask: The Batman Dead End Story in a clear 16 by 9 widescreen aspect ratio with English Two-Chanel Sound. There are no extra features or subtitle options found on the disc. 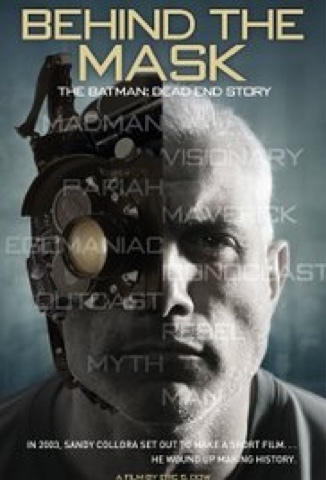 Definitely worth checking out if one is at all remotely interested in Batman: Dead End, Behind The Mask: The Batman Dead End Story is available now on DVD courtesy of Candy Factory Films and is also available to stream on iTunes, Amazon and Google Play.